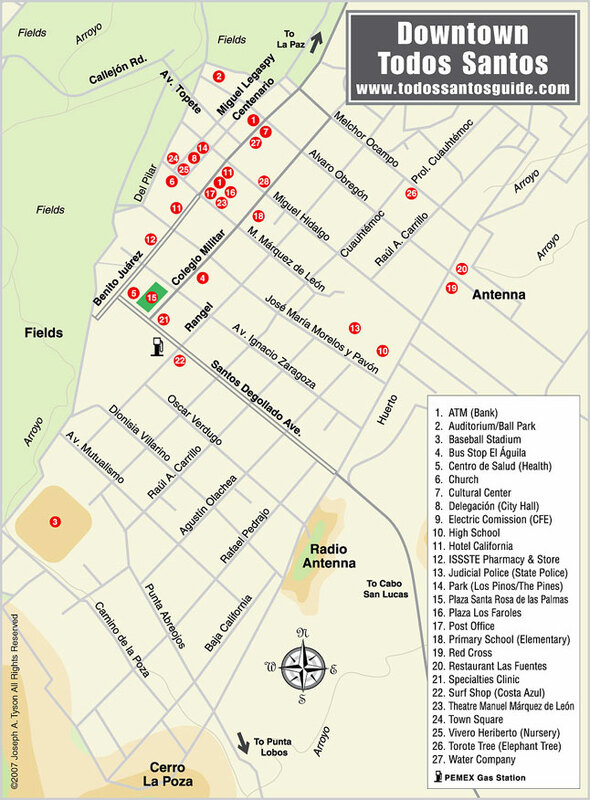 Detailed map of the downtown area of Todos Santos, Baja California Sur, Mexico. Notice: These map icons and the larger map files are solely intended for the viewing pleasure of our readers, travelers and tourists who would like to get a better idea of the street layout of Todos Santos, Baja California Sur, Mexico. These street maps may be printed by travelers and tourists on their home computers and used for their trip to the Todos Santos area. These street maps may not be used for any commercial purposes. They represent hours of research and illustration time. The use of these maps in other websites on the internet or any other media is strictly prohibited unless full written permission is obtained directly from our publisher. These maps and other pictures and photographs on this web site are protected by U. S. and international copyright. All rights are reserved.